This product is generally used on the coach roof of a yacht to cross a loaded line from one side of the boat to the other. Used to inhaul the genoa sheet. Designed for the RP52 "Scarlet Runner"
Designed for use on SWS 94 "Kiboko"
This block can be used with up to 18mm diameter rope. 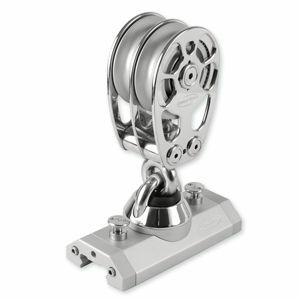 Designed for the Traditional Barge "Lotus Eater"
Designed for use on the RP62 "Limit"
Used for the gennaker tack of the SWS 94 "Kiboco"
B100-1215 Series 100 double block, polished st.steel cheek plates. Used for mainsheet deflector block. Designed for the SWS 110 "Thalima"
Designed for use on the SWS 94 "Kiboko"
Designed to handle high shock loads. Used on 33m yacht. This block is suitable for up to 30 mm diam rope. Used on the SWS-110 "Thalima"
Used for athwart ships 2:1 purchase mainsheet systems. Used on the ORMA 60 "Brossard"
Used on 60 foot hydrofoil "Hydroptere"
Used on Arabian 100 "Majan"
Used on the Davidson 69 "Pendragon 6"
Used for deck recessed traveller on "Gliss"
Used on the SWS 94 "Kiboko"
This mainsheet car is used on a high tech record breaking trimaran. Ideal for the fast cruising sloop. Batten systems used on IMOCA Open 60's such as Virbac,Hugo Boss,Gamesa etc. Used on the Gunboat 66 "Phaedo" and A65 Catamaran. Used on the Arabian trimaran "Majan"
Used on the Arabian 100 trimaran "Majan"
This is a high load series 30 batten car,using torlon ball bearings as the bearing surface. This headboard car was used on the mizzen sail and could also be used on the mainmast of smaller yachts. This headboard car was used on the mainsail. Used for transverse genoa systems. Designed for the yacht "Limit"
Designed for SWS 94 "Kiboko"
This car is used as a general purpose plunger stop car on yachts up to approx.40ft 12m length overall. Used where the control line purchase has to be attached directly to the car body. G400-0070 Series 55 Genoa car with plunger stop. This series 55 genoa car is fitted with captive slide rods. This series 42 sliderod car is used to carry the furling unit for the code zero sail on the record breaking high tech trimaran.